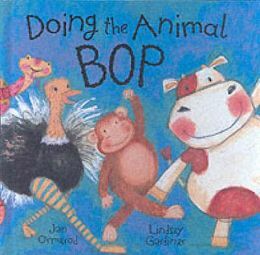 Picture books often have a simple story line with a strong rhythm and plenty rhyming words: Doing the Animal Bop by J. Ormerod and Lindsey Gardiner begins ‘If you like to dance and you sometimes sing, Why don’t you do the animal thing?’ It is hard for children to resist the urge when this is read aloud to get up and try to move in the same way as each animal that appears in these pages, jiggling and jiving, waddling like a duck or stomping like a rhino. This is not really a story at all, more of a poem that introduces a series of animals, one on each double page, concentrating on the way they move and the sounds they make. As well as rhyme, there is onomatopoeia in the ‘Craak, craak, craak’ of the penguin song, and alliteration in the ‘flim-flam flutter of the ostrich flounce’ or the monkeys’ ‘jive and jiggle’. The hissing of the snake is exaggerated in the line ‘you can ssssssing this ssssssong’. The chickens peck and cluck whilst the rhinos roar and rage. On the final pages the line ‘so let’s end up with a great big mooo!’ (because the cow can only chew) becomes so familiar that children love to join in. There is after that one more double-page illustration of the animals in silhouette dancing off into the night under the pink stars in the dark blue sky. It’s as though they are off to party all night. Both rhyme and rhythm come through in no uncertain terms, creating a lively pace. This is an ideal book to encourage children to get up and move, exercising and trying to stomp, waddle, jive or slither like a snake. You can imagine that it’s probably not the best bedtime story, unless you want your child to run off a little more energy before slipping under the covers. I absolutely love the use of colour in Lindsey Gardiner’s illustrations. The backgrounds in particular are striking, and all are different colours. A pink elephant trudges along against an orange background, whilst a pale green lizard moves on a salmon pink ground. The ostrich seems to have borrowed Winnie the Witch’s stripy tights, bouncing and flouncing on a deep pink background. In each picture there is a tiny mouse with a yellow tummy and tail; we meet it right at the beginning, and children can have fun spotting where it is on each page throughout the book, as it frequently tries to imitate the other animals. This is a feast of language and colour, and a delightful way of teaching very young children about the sounds and movements of different animals. Recognising rhyming words is said to be a fundamental precursor to reading, so that is one more reason to make this an ideal book to read aloud, perhaps to children as young as two. It may not be the easiest book for a young reader to tackle, unless a particularly confident one is looking for a challenge. If you are looking for a book that will impart a love of the sounds of words to your children and at the same time get them out of their seats, this could be the ideal one. No Comments on "Doing the Animal Bop"